Camilla d'Errico is one of the bigger names in the world of pop surrealism art. Her style is very recognisable and her ideas, for a lack of a better description, Camilla-d'Errico-ish. LOL. This is a 144-page hardcover that features her paintings from several exhibitions. The artworks are grouped under each exhibition which has a theme. You'll see the rainbow motif a lot, even on the over, the character has rainbow tears gushing out like a waterfall. In other paintings, you can frequently see female characters submerged in rainbow liquid. The colours are often bright and pop out at you. Towards the back, there are more outlandish characters with cute animals on top of the their head. You can definitely spot the inspiration from Japanese manga when it comes to character design, especially the way the big eyes are drawn. In addition to the paintings, there are also numerous sketches, mostly uncoloured. They are quite detailed and in many cases would look pretty good if they are actually painted. 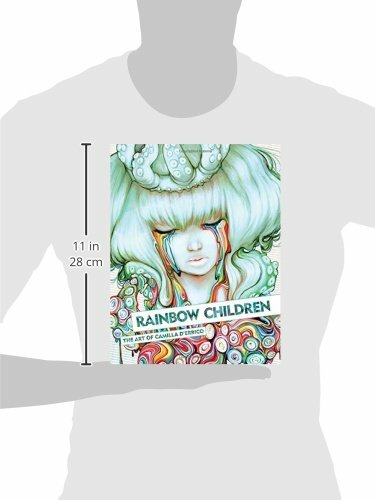 The last few pages showcases merchandise where the artworks are used on, such as on clothes, notebooks, toys, chairs and more. Finally there are some photos of Camilla d'Errico with her fans and at different events. Production quality of the book is high. It's a great book for fans and those who like her style of pop surrealism.